After breakfast drive North to Kombolcha and en route visit the Selassie Church at Debre Brehan. Overnight stay in Sunny Side Hotel. Arrive in the late-afternoon to the holy city of Lalibela, a town with 11 monolithic churches built in the 12th century. The churches of Lalibela have been classified as a UNESCO World Heritage Site. Overnight stay in Mountain Hotel. After breakfast visit all three groups of the rock-hewn churches in the town of Lalibela. Overnight stay in Mountain View Hotel. An early morning breakfast and drive north to Mekelle. Overnight stay in Milano Hotel. Drive from Mekelle to Hamed Ila via Berehale where you will pick up regional police scouts, road guides and show the permits to enter the Danakil Depression. From Berehale, proceed driving to Hamed Ila. On the way, you will see camel caravans carrying salt from the salt flats of the depression to the highlands to trade. Overnight camping in Hamed Ila. After breakfast, take a day trip to Dallol, which at 116m below sea level is the lowest point on the African continent. 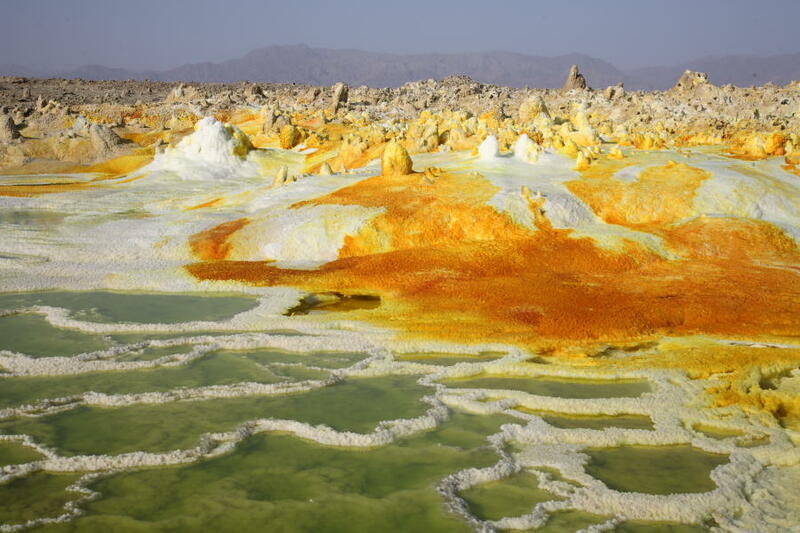 You will also visit Lake Asale, which is the salt lake from which the Afar nomads extract salt. You will witness their laborious task of removing salt from the ground as hundreds of camels relax before the long trek back to Mekelle. At the end of the day you will return to Hamed Ila for overnight camping. An early morning drive south takes you from Hamed Ila to the trailhead for the volcano Erta Ale via Kusawad. The Erta Ale volcano has been in a constant state of eruption for over 40 years. You will camp in the village of El Dom, where it will be an early-to-bed night camping. Today is an early-to-rise start at 2am to start the two hour hike to the rim of the Erta Ale volcano. At the top, you will peer down at the lava lake as it bubbles and explodes, all while the sun rises over the horizon. Definitely the highlight of the trip! After the hike back to camp and a bit of breakfast, you’ll continue driving to Lake Afdera for overnight camping. Today after breakfast you drive from Semera to Awash National Park through the Yangudi-Rassa National Park. Overnight on the edge of Awash Falls in the Awash Falls Lodge. In the morning after breakfast drive back to Addis via Mojo. You will arrive in Addis Ababa late afternoon with time for souvenir shopping. Then after the farewell dinner, check-in for flight back home.